Previously thought impossible, thanks to syslinux 4 this feat can now be achieved in a few easy steps. Recently, I had a talk on IRC with the developer of the Arch Linux installer, who wanted to enable Arch Linux installation on legacy BIOS systems with GPT partitioned media. As I usually carry a bootable USB flash stick with me, containing the netboot installers for various popular Linux distros (don't worry, all of them can be abused to install Gentoo as well), I thought that maybe it is time to get this up to date with the latest and greatest in partitioning and file systems. GPT, short form of GUID Partition Table, is the standard for EFI systems and is intended to replace MBR style partition tables. Advantages of GPT include support for up to 128 partitions (no distinction between primary and logical), no limitation to 2³² sector disks (2 TiB for 512 byte sectors), and increased redundancy for easier recovery. No real reason, other than it being the new hotness (in spite of some design flaws). EXTLINUX from the syslinux family of boot loaders can boot both from GPT and btrfs. An alternative would be GRUB 2, which however uses not the standardized method described in T13 EDD-4 Annex 1 and needs special patching for btrfs still. When first launching gdisk you will be greeted by a message that either the disk was found unpartitioned and a new GPT has been created, or that your existing MBR has been converted to GPT. In this example we use /dev/sdc as the device and /mnt/usb as the mount point. Now we proceed to create a partition (gdisk syntax follows fdisk closely) and then enter expert mode to mark this partition legacy BIOS bootable. Note that due to a bug in gdisk-0.6.9 and earlier, you need to enter 61 instead of 2. This will be fixed in a future release. Verify that you have the correct attribute flags, which are 0000000000000004. Now write the partition table to disk and exit gdisk. In this example, we put the Debian Squeeze amd64 netboot installer on the USB drive. Same thing works for the netboot (sometimes called PXE) installers of other distros too. Now your USB stick should be bootable and ready to use. While syslinux supports chainloading on GPT disks, you cannot boot Windows this way, because Windows requires an EFI system in order to boot from GPT. ChromeOS uses a slightly different method of booting from GPT, which resembles the old syslinux 3 and current FreeBSD way (even using the gpt utility from FreeBSD). If you are interested in their way, look at the ChromeOS installer scripts and the gpt utility. A nice description of the issues surrounding booting from GPT can be found at the gdisk website. When it comes to terminal managers in Linux, it usually boils down to three choices: screen, tmux or the dtach+dvtm duo. Proponents of each often vigorously tout their solution as the best. So let's see how they compare. 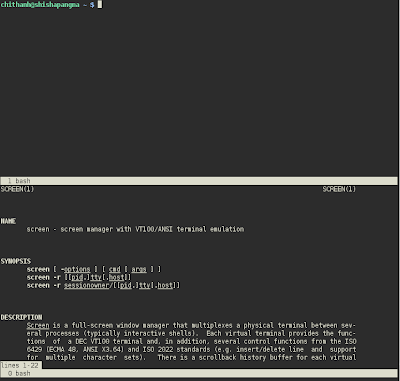 GNU screen is the oldest and perhaps most widely used of the terminal managers in this comparison. It has been around since the 1980s and made thousands if not millons of users' lives easier since then. 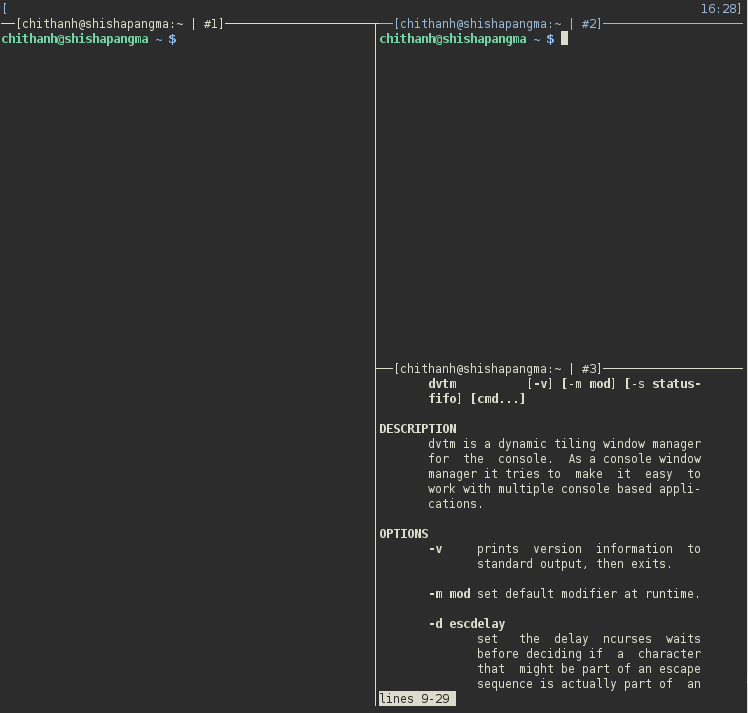 tmux is a relative newcomer, the first release dating to late 2007. It was developed specifically with the goal of overcoming limitations in the implementation of screen. dvtm is best described as tiling window manager for the console. First released in late 2007 too, it lacks the disconnection/reattachment feature of the other two solutions, so it will unleash its full power only in combination with dtach which does exactly that. 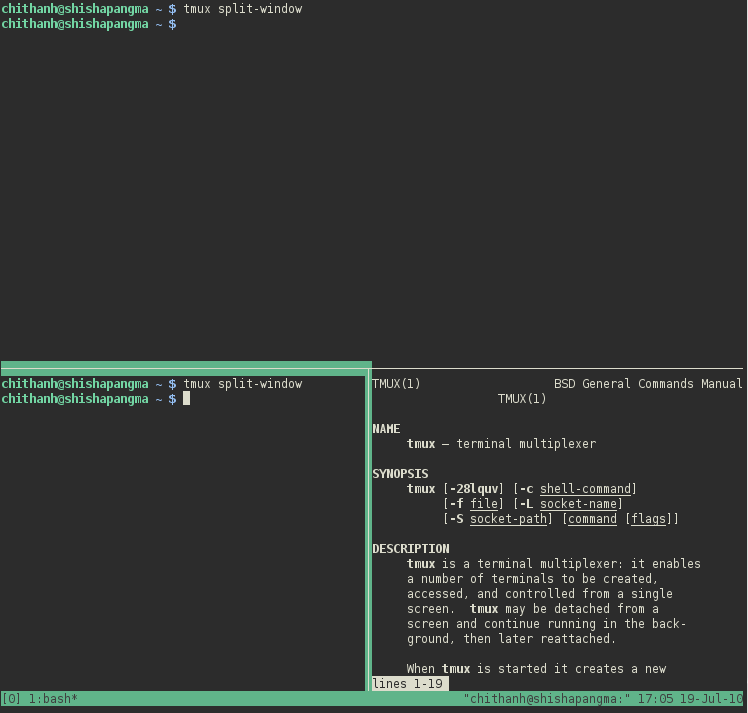 (Using screen/tmux with dvtm is also possible.) dtach was released in 2004. The contenders will have to show how they perform in the aspects that matter to the modern geek. This includes mind share, adherence to Unix philosophy, features, efficient use of resources and ease of use. GNU screen has been around longest, so has had more time to capture users. Measuring popularity using Google is a bit difficult, as searching for "GNU screen" (with the quotes) will probably under-report while searching for "screen" will over-report actual numbers. A Google Trends analysis omitting the quotes sees screen in front, with tmux a distant second. This more or less matches the Debian Popularity Contest, which currently clocks screen at position #756, tmux at #6159 and dtach/dvtm at #6242 and #8604 respectively. The Unix tools were developed with several precepts in mind, an important one being "Make each program do (exactly) one thing well". In this tradition, dvtm tried not to include everything but the kitchen sink, but instead leaves the disconnection/reattachment function to dtach, and displays auxiliary data such as the status bar and clock via named pipes. 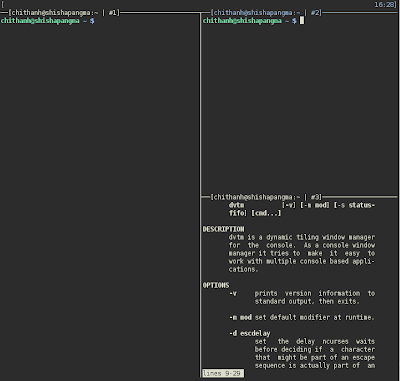 screen and tmux on the other hand integrate all functions in one large binary. In the time that screen has been around, it was able to accumulate a lot of legacy code, which results in a download size of 821 KiB. tmux is noticeably smaller, only 237 KiB. But this is still huge in comparison to dtach and dvtm, whose combined download size is only 81 KiB. This is probably due to their adherence to Unix principles, which helps to keep the bloat at bay. But not only the download is smaller, the memory usage of a dtach+dvtm session is significantly below that of the others, too. The best way to start screen or tmux is just running the binary. You will be immediately in an environment where you can use all the features. dtach and dvtm have to be started together, and the user himself has to manage the dtach sessions manually. All contenders have been able to win two of the comparisons. If you are already used to screen and don't need the extra features of tmux, then you can stay with screen. If you prefer an elegant and Unix-like approach, dtach+dvtm are what you want. 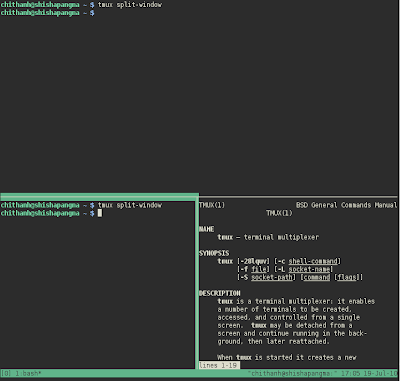 If you however want many features and a solution that Just Works™, then tmux may be for you. Gallium3D is the new driver architecture for Mesa. In the X11 overlay you will now find an eselect mesa module, which in conjunction with the live mesa ebuild allows you to switch between classic and gallium. i915, i965: The gallium drivers for Intel chipsets are presently inferior to the classic drivers. There is little reason to use them at this time. Radeon r300: The radeong gallium driver works well and has recently surpassed the classic driver in terms of features and performance. Radeon r600: The r600g gallium driver was added to mesa a week ago and does not do anything useful yet. Software renderer: If Mesa was built with the "llvm" USE flag enabled, then the gallium llvmpipe driver will give you much improved performance over the classic software rasterizer. As a tile based renderer it will use multithreading too. However some graphical glitches are still visible. If you encounter any issues with eselect mesa, feel free to join #gentoo-desktop on freenode or report a bug, prefixing the summary with "[x11 overlay]". Update: If you had already installed mesa-9999 from the X11 overlay, please rebuild it to ensure proper functioning of the eselect module. For some time already, Gentoo has provided packages for the open source nouveau driver for NVidia graphics chipsets. Some users have discovered this and attempted to install nouveau, running into a few problems, most commonly experiencing the API break before libdrm 2.4.18 and after kernel 2.6.33. Should I run nouveau or not? Can always build with the latest kernel and xorg-server code from git. Supports all Riva TNT, GeForce and integrated chipsets, except for the GTX 400 series. Kernel Modesetting for framebuffer console at native display resolution and flicker-free vt switch. XRandR 1.2 support for dynamic output configuration. TV-out only works on NV40 and older. 3D acceleration is experimental and not recommended for the timid. Check the nouveau Feature Matrix for more details. If you have decided that you want to try nouveau, the best way to proceed depends on whether you run a (mostly) stable system, an unstable (~arch) system or whether you always live on the bleeding edge of development. Before you begin, ensure that eselect opengl is set to x11 and you are not loading the proprietary nvidia kernel module. However the drm in kernel 2.6.33 is a bit old and will not support the integrated 8200/8300/9300/9400/ION chipsets. =media-libs/mesa-9999 from the x11 overlay, built with USE="gallium" and VIDEO_CARDS="nouveau" (only if you want the experimental 3D acceleration for which nouveau developers provide no end user support). Stop by in #gentoo-desktop on freenode or post in the forums if you have any questions.